We are eager to serve you as one stop solution for all your queries on medicines & allied products both in terms of availability and counseling. The Thumbay Pharmacy’s mission is to provide a safe, high quality pharmaceutical care to our patients in a professional ambience, shared respect and cordial communication. The pharmacist's role is to provide at all times, an adequate supply of safe, effective and good quality drugs in appropriate dosage forms consistent with the needs of the patients and to rationalize drug utilization in collaboration with the medical staff. 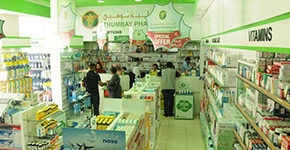 The Thumbay Pharmacy shall satisfy the need for pharmacists performing their role as the vital link in the chain of health professionals dedicated to patient care.